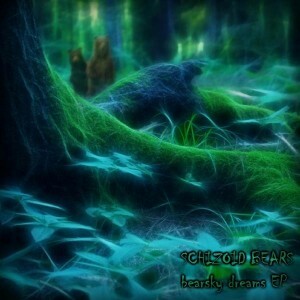 Bearsky Dreams is the first solo release of Schizoid Bears, a psytrance project of two guys from Lithuania, C.Monster and P.Tale, founders of the Mishko Dazhniai (Forest Freaqs) crew, already known for releasing the compilations Under The Moss, Under The Moss Vol. 2, and Voices Of The Trees. True to form, this release contains four sizzling psychedelic wonders that will lead you into the ancient majesty of the sacred groves without abandoning the musicality that characterizes the Lithuanian psytrance sound. Mastering and artwork by Forest Freaks. MP3 Download | FLAC Download | WAV Download · Download count: 13,560. Deep forest Psy !! Love it !! Lithuanian forest music is always a treat! Великолепная музыка!! !Нестандартное звучание уносящее куда-то в глубь леса.Можно смело слушать с закрытыми глазами и в трипе. I normally don’t listen to darkpsy but I was impressed by the very original artwork….from track one I got fully immerse into a very well done mix between dark atmosphere and sweet melodies. Deep psy waves! molodci rebyata! This is unique special music! and realy good strong sound! thanks for sharing this amazing release! Oh My F#%&#%g god. Insanely good ! This goes straight up on my top 10 ! Very nice music! Every track! And yes, reminds me of Dejavufabrique too! and it’s very great! Really like this a lot! Fine, dark music for lonely roads at night. Thanks for posting this excellent release! these are 2 guys :) U can always write for me [email protected] and get contacts of schizoid bears. Forest Freqs! Nice to meet you! thank you for giving me a real touch of what Forest is.. very dark and beautiful… Cheers Lithuania! !